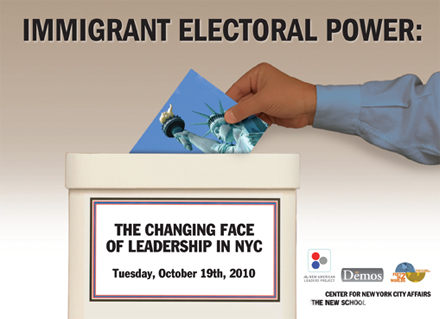 On Tuesday, October 19th, The Center for New York City Affairs will present Immigrant Electoral Power: The Changing Face of Leadership in NYC,, a panel focusing on immigrants’ participation in New York’s state and city politics. The discussion features insight from Sayu Bhojwani, The New American Leaders Project; Margaret Chin, New York City Council Member, District 1; Julissa Ferreras, New York City Council Member, District 21; Jonathan Hicks, The DuBois Bunche Center for Public Policy at Medger Evers; and John Mollenkopf, Center for Urban Research, City University of New York. The event is moderated by John Rudolph, Feet in Two Worlds. Immigrant Electoral Power, takes place from 6:00 to 8:00 p.m. at the Theresa Lang Community and Student Center, 55 West 13th Street, 2nd floor. Admission is free but space is limited, so RSVP to centernyc@newschool.edu.